Don’t limit yourself to an average sized towel—spread out and soak up the sun. This quick-drying, oversized towel has a velour top, terry bottom, and a beautiful tassel trim. It packs light and opens wide. 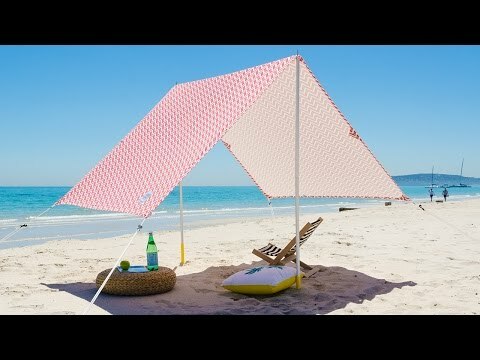 Dimensions: 59" D x 0.25"
Pitch this beautiful beach tent to enjoy UV-protection and the summer breeze under a single roof. You’ll be able to get your dose of sand, wind, and water minus the harmful rays. 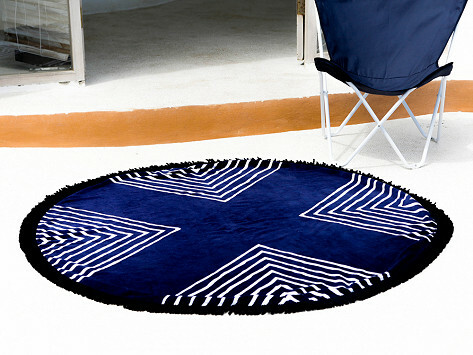 The tent’s canvas has UPF 40 to block 97% of UV rays and an A-line design that stays put even with brisk summer winds. Aussie Makers Jackie and Kellie are well acquainted with the thrills and perils of beach going, with their nation having some of highest UV levels in the world. So they decided to equip you with the best gear. They didn’t stop at the tent. Their oversized beach towel has a velour top, terry bottom, and beautiful tassel trim so you have room to spread out and soak up the sun. Its lightweight design dries itself and you off quickly. We hope Jackie and Kellie keep putting their creative minds together, letting us enjoy more elegant, practical designs.